Curls tend to fall out because thick hair has a bit more weight than other types of hair. It takes longer to style thick hair because there is far too much hair to handle. There are a few things to remember when curling thick hair. 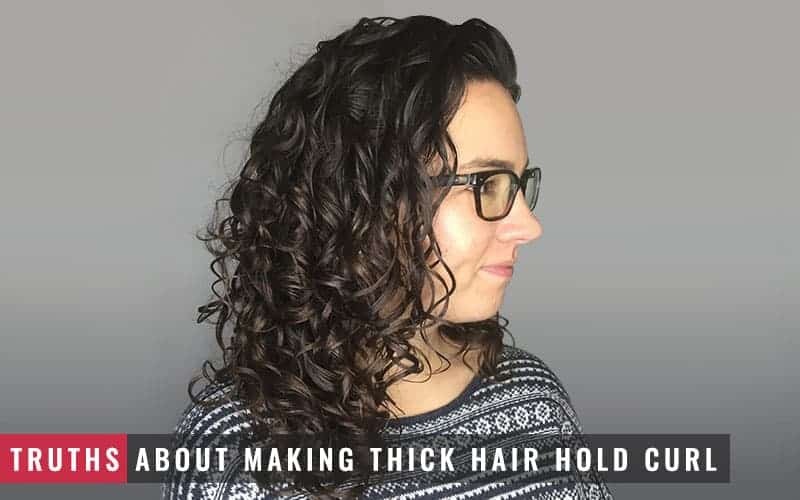 The hair product, heat styling tool, hair styling accessories, and hairstyling method you use can spell the difference between curls that hold and curls that do not. Read on to find out how you can get thick hair to hold ringlets, waves or curls longer. Pay close attention to the following factors when curling thick hair. If you do these things right, you can rest assured that your hair will hold those curls. 1. Which Hair Products Are Appropriate? The hair products you use for styling your thick locks into splendid waves, curls, or ringlets are key to helping you achieve the right texture. To give your hair curls that will hold, it must have a good grip so the style will not fall out within a couple of hours. A palm-sized quantity of texturizing product will help to build grip. However, stay away from volumizing products which will weigh down thick hair even more and cause your curls to ultimately fall apart. Since thick hair requires a higher temperature to alter its shape, it is better to apply a heat protection product before using the curling iron or setting in the hot rollers. To avoid using too many hair products which can weigh down your hair, use a setting spray with heat protection. This will give you the dual advantage of helping your curls to set and protecting your strands against possible heat damage. 2. 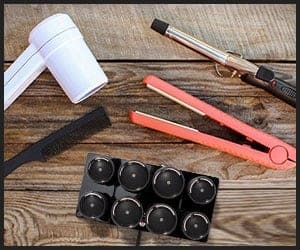 Which Heat Styling Tools Are Ideal? For long-lasting curls, you have a range of thermal tools to choose from. Curling iron, curling wand, hair straightener, blow dryer, and hot rollers are tools which will help you achieve beautiful styles. It is highly recommended to use hot tools with titanium and tourmaline plating because they heat up faster and uniformly heat your hair. The curls will not last if the heat is not evenly distributed throughout your hair. Blow dryers should be used with a diffuser attachment for a consistent flow of warm or cold air which will help your thick locks to set in more firmly. Thermal tools with an adjustable temperature are also preferable to help you see the precise temperature of the tool. Thick hair needs a higher temperature to achieve curls, waves, or ringlets that will hold. The size of the tool also matters especially since a smaller curling iron is better at making thick hair hold curl. The number of rollers – long thick hair requires at least 12 rollers. The size of the rollers – you will need different roller sizes to accommodate all of your hair especially if you have a layered hairstyle. 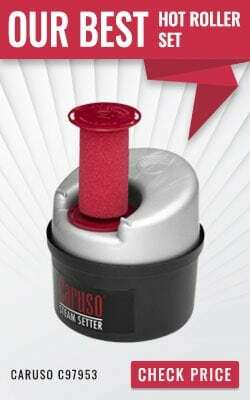 The type of flocking – hot rollers with velvet flocking help to combat frizz and split ends in long thick hair. 3. Which Hairstyling Accessories Are Necessary? Since you have lots of hair to deal with, it is a good idea to be ready with plenty of bobby pins and duckbill clips. 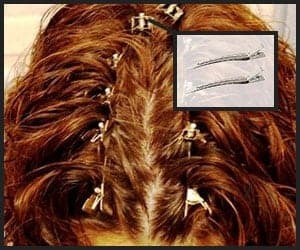 You will need the clips to section your hair and the pins to pin up your curls while they cool. Ringlets will require more pins than loose waves so make up your mind before you start styling and keep your accessories close at hand. 4. Which Hair Styling Method Is Fail-safe? It is imperative to start with completely dry hair if you decide to use a heat styling tool. Wet hair will end up fried and appear dreadful. With no-heat options too, starting with wet hair is unwise because the curls will fall out as your hair dries. When you pin up your curls, leave them like that for at least 30 minutes even if they have cooled. It takes just as much time for the bonds in thick hair to form completely. After 30 minutes have elapsed, unpin your curls and spray a firm-hold finishing spray to help your hair hold the curls longer. Parting your hair into 8 or more sections will make your thick mane more manageable. Depending on which style you desire, create as many sections as required with the help of duckbill clips. For loose waves, you will need to create at least 8 sections. For neat ringlets, 12 or more sections may be necessary. 10-12 sections will suffice for pretty curls. Since thick hair is less inclined to styling due to its weight and density, it is important to decide on the right products, hot tools, accessories, and method for curling it. Texturizing mousse, heat protection serum, and strong-hold hairsprays should be lightweight so they do not weigh down your hair any further. Hot tools with titanium-tourmaline coating and ionic technology will help to control frizz and split ends. An abundant supply of pins and clips should be kept handy for the curling process to go smoothly. Last but not least, you should make sure your thick locks are completely dry to avoid either damaging them with hot tools or ruining the style once your hair dries.